Back in August, Disney revealed that the studio is teaming up with Lin-Manuel Miranda and Alan Menken, who are set to write new music for the studio's The Little Mermaid remake. We haven't heard any more on the remake since then, including who will be cast, or who will serve as writer or director on this coveted project. Today we have word that actress Lindsay Lohan may be throwing her hat in the ring for the Ariel role, after a new post on Instagram this weekend. 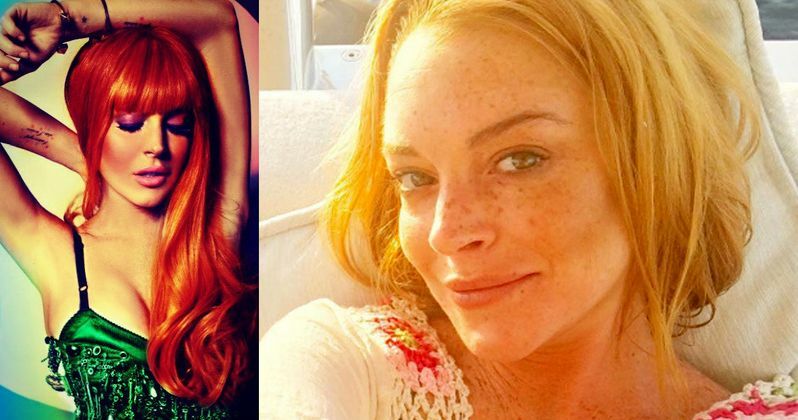 While Lindsay Lohan doesn't specifically state that she wants the Ariel role, she posted a side-by-side picture of herself with red hair, and the redhaired animated version of Ariel. She didn't state anything else on Instagram, only using the hashtag #TheLittleMermaid. It isn't known if the script is even ready or if the studio is ready to start the auditioning process, but we don't know if the studio would be interested in casting the actress. Disney previously brought on Hamilton creator Lin-Manuel Miranda to star in Mary Poppins Returns, alongside Emily Blunt. It seems the studio is doubling down with this actor-musician, bringing him aboard their remake of The Little Mermaid, where he will compose songs alongside Alan Menken. It isn't known if he will also act in this remake, but he is said to be involved in supervising the story and overseeing the writing of the script. Lin-Manuel Miranda will also produce this live-action remake with Marc Platt, who is currently prepping his long-awaited big screen adaptation of the Broadway sensation Wicked. This news comes just a few months after a report surfaced that the studio wasn't sure if they wanted to move forward with this new live-action project. There is currently another live-action adaptation set at Universal Pictures, with Chloe Moretz to star as Ariel. Up and coming director Rebecca Thomas is taking the helm, working from a script by Richard Curtis. There is also another Little Mermaid project that boasts a cast including Shirley MacLaine, Gina Gershon, William Forsythe and Poppy Drayton, from directors Chris Bouchard and Blake J. Harris. This Disney version will feature new songs written by Lin-Manuel Miranda and Alan Menken and songs from the 1989 animated classic. Lin-Manuel Miranda reportedly has a soft spot for The Little Mermaid, even naming his son Sebastian after the beloved crab in the musical. Alan Menken won two of his eight Oscars for The Little Mermaid, one for Best Original Song with Howard Ashman and the other for Best Original Score. This project marks just the latest in a string of live action remakes from the studio, including recent movies such as Alice Through the Looking Glass and Pete's Dragon, and the upcoming Beauty and the Beast, hitting theaters March 17. Others in development include Cruella starring Emma Stone, Tim Burton's Dumbo and sequels to Mary Poppins, Maleficent and the current hit The Jungle Book also in the works. Disney is also working on a live action prequel to Aladdin, a Winnie the Pooh live-action project, along with Lasse Hallstrom's The Nutcracker and the Four Realms and Ava DuVernay's A Wrinkle in Time. Take a look at Lindsay Lohan's Instagram photo below, and stay tuned for more on Disney's the Little Mermaid.